Organizations most often come face-to-face with compliance either when something in the network breaks or when an audit comes due. Either of those instances can send IT staff on mad scrambles to research compliance requirements and find ways of documenting that they have been fulfilled. Reliance on legacy efforts and traditional techniques to attain and maintain compliance has left many organizations failing with non-compliant networks. Compliance isn’t an option, it’s a requirement. Failure to meet compliance regulations can result in fines, dangerous network exposure and even damage to your company’s reputation. 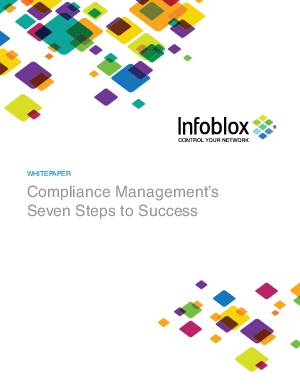 Can your organization meet and exceed compliance requirements cost-effectively and in a timely manner? Read this white paper to learn how to get your network compliance completely under control with automated tracking, analysis and reporting.